Can apprenticeships save young people from the threat of AI? More than 5 million jobs will disappear from manufacturing and customer service by 2020. As leaders, we are faced with the challenge of artificial intelligence (AI) transforming the way we work in all industries. So what can we do to ensure a smoother transition for our employees? The World Economic Forum has predicted that by 2020, more than five million jobs will disappear in manufacturing and customer service. Yet, we can expect AI to create jobs elsewhere; according to a recent survey by Capgemini already today four out of five companies have created new job roles through deploying AI-based systems. The one thread we all have in common is our support of effective interventions, such as work-based training programs, particularly apprenticeship as a way to guarantee skills and to help our employees cope with the onset of AI. Although education and training have traditionally been the responsibility of the public sector in most countries, companies are increasingly recognising and responding to the needs of educating and training our future workforce, especially for reskilling and lifelong learning. Stigma – apprenticeship and vocational training are still perceived as a second-rate track in comparison to going to university. The general public is unaware that apprenticeships do and can exist more in future-facing industries, increasingly linked to the world of AI including, banking, IT, human resources, healthcare and tourism. Costs and complexity – regulating apprenticeships can be a heavy process in many countries and therefore a hindrance to employers and possible apprenticeship candidates. Without the right incentives and easier registration processes for employers, innovations in skills training are less likely to happen. As employers, we know that there is a strong business case in support of apprenticeships and we are making strides in several countries to change legislation in our favour. We as business leaders choose to invest in work-based training programs for several reasons, but two stand out: we care about our communities and it makes financial sense. As drivers of the AI revolution, we are creating both new technology and jobs. By 2025, 90% of jobs will require digital skills, yet only 40% of EU citizens meet these criteria. If we want to reap the benefits of AI, we need to skill our workforce accordingly. The age of AI does not need to be viewed as all gloom, job losses and disappearing industries. There are many opportunities in new jobs and skills to be learned, with employers driving change in both technology and training. With increased AI, we are also more aware of the need for more human skills such as empathy, team building, communications and critical thinking skills. Whether soft or hard skills – apprenticeship can hone and bring together both ends of the spectrum. 2020 has been placed on the horizon as the year where millions of jobs will be lost, and replaced by new jobs. Collectively, as employers we have also set targets for 2020 to ensure that work-based training programmes, such as apprenticeships continue to create value for our community and enhance our core business. Collectively, we have joined as members of the Global Apprenticeship Network (GAN), a platform where we engage with public sector partners, setting targets on a global level, while acting locally. In 2016, GAN members met at the White House and collectively pledged over 9 million opportunities for youth, sparking the Global Apprenticeship Movement. By 2017, we launched the 20 x 20 x 20 GAN Challenge, to further impact 20 million youth through the engagement of 20 GAN Board Members and establish a global footprint in 20 countries by 2020. To keep up the momentum, we will be meeting during the World Economic Forum Annual Meeting 2018 at Davos, uniting for skills, jobs and youth. As GAN Members, we are leading the change to offer practical solutions to the pressing challenges of unemployment and skills mismatch. At Accenture, we have recently launched a booklet called “Jobs Now” with the Swiss- American Chamber of Commerce, the GAN and ETH Zurich/KOF Swiss Economic Institute on how the Swiss model offers solutions to help US employers reduce their workforce skills gap. It is a guide on best practices of Swiss companies with US operations and shows how US state governors are developing new apprenticeship models to promote work skills. According to our Chief Leadership and Human Resources Officer, Ellyn Shook, “apprenticeships can accelerate reskilling in the digital age” offering the future workforce a way to both earn and learn. Through our Skills to Succeed Initiative, we aim to equip more than 3 million people with the skills to get a job or build a business by 2020. At the Adecco Group, we are building innovative tailor-made apprenticeship programs that link youth, educators and employers in countries where our role as employer allows for such a solution. As an example, our Youth Employment Solutions (YES!) program in North America has introduced 2,500 students and educators in Kentucky to the merits of work- based training. We have secured permanent employment for 93% of participants in their chosen field and created a pool of skilled candidates through work-based training in the most sought-after industries, including healthcare, welding, IT, supply-chain management, business administration and engineering. Building on this best-practice and through continued partnerships with further States and companies, we pledged to facilitate 10,000 work-based learning opportunities in the US, with an emphasis on apprenticeships, by 2020. Microsoft is committed to empowering young people with the skills they need for jobs of the future. In a society where technology is changing every aspect of how we live, we need to ensure nobody is left behind and that our youth are prepared for the rapidly evolving labour market. As an example of our commitment to vocational training in Europe, we launched a national apprenticeship programme in the UK in 2010, which has helped place more than 15,000 apprentices in over 8,500 small and medium-sized businesses across the country. Microsoft has also committed to increase access to computer science education and digital training for five million young people across 28 EU member states from July 2016-July 2018. Vocational training at UBS has always been highly valued and forms an integral part of our career development offering. Last year we offered training programs to approximately 1,700 young people, including apprentices, school leavers, high school students and university graduates. Many of our apprentices remain with the bank and some assume key leadership roles. This was, for instance, the career path taken both by our CEO and by Markus Baumann, our Group Company Secretary. UBS also supports important vocational training initiatives. Our firm is a partner in the new Switzerland-wide SwissSkills initiative, which aims to engage in a broad-based, powerful and positive dialogue with the public on apprenticeship training. This dialogue takes place via three platforms which make practical professional training more tangible and accessible. We are actively engaged in all three of these platforms. 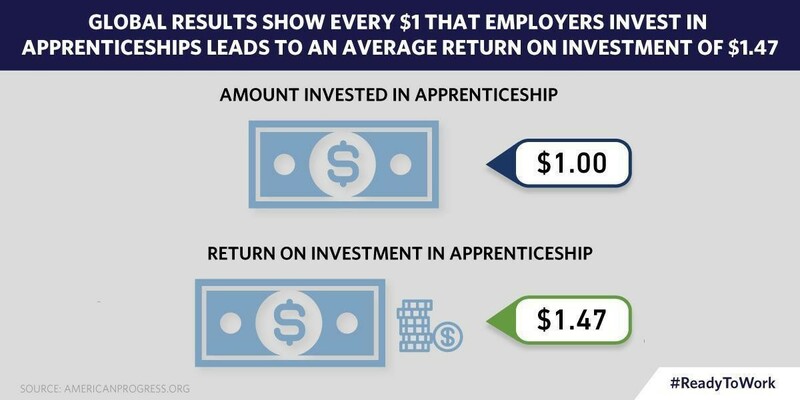 Apprenticeship is not a new fad, it is an age-old concept that has been with us for centuries. As employers, we know what we need to refresh apprenticeships in the age of AI. With optimism and the right partnerships, incentives and policies, we must continue to join forces to turn youth unemployment into a thing of the past, while promoting new work skills for generations to come.